Down in the forest where nobody goes...the children have had another cracking week. The younger children have loved having the holiday campers for another super duper week. We will really miss them now the week is over but hope to see some familiar faces when the next holidays come round. On reading our poetry book, ‘Mad about Minibeasts’ by Giles Andreae, the children of Paradise set about on a tremendous minibeast hunt. Searching for their favourite minibeast from the poems they had read, they left no log unturned as they explored potential habitats. Carefully putting the minibeasts they had discovered back in their homes, the children took to creating their own minibeasts using clay. We talked about what parts of the body their insect had, such as whether it had wings or antennae. The children chatted away about how many legs they needed and tried to count them out, matching the number to the picture in the book. The children have also been keen to get their faces painted, which led to wonderful imaginative games with the children taking on the roles of their new identities. From hungry monsters and their assistants making monster concoctions, to cats with incredible climbing ability. Whatever will they choose to become next week? 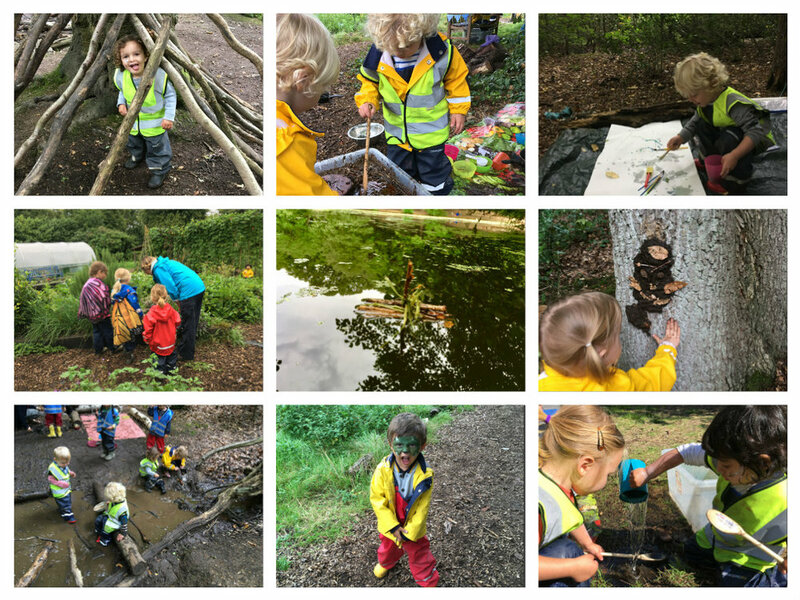 Adventure walks have been very exciting for the children (and educators! ), over at our Windmill site. This week we tried our hand at boat making by the lake. After collecting sticks, the children had to find a way to attach them together. Our newest educator and forest guru, Amy, to the rescue! Using nettles and stripping back the leaves, Amy showed the children how you could make natural twine to connect sticks together. Then, the beautiful boats were ready to set sail. After making predictions about whether they would float or sink, our vessels were put to the test. The children were so excited to place them gently into the water and discover they could indeed float! Success! Mud has always been a forest folk favourite over at the Windmill and this week saw the creation of ‘Mud Castle’, complete with slotted spoon flag and a moat. The older holiday campers loved exploring how to dig a channel in different directions to try and direct the water back to the stream. Meanwhile our younger folk rushed back and forth with buckets of water to pour into the moat so that they could see the water gushing down, ‘Waterfall!’ they shouted to one another! The children also had a blast creating mud faces on the trees. After smearing a little mud on the rough bark, they collecting a big clump of the gooey stuff into their hands and patted it together before slapping it onto the tree. The children then thought about the parts of the face that their mud monster needed, and set about hunting out the perfect leaves and twigs to create eyes, noses, mouths and ears. It was brilliant to see the children creating these masterpieces independently, working together to discuss their next creation. Thanks to everyone for such a lovely week in the forest.